On December 20 when an expert committee of the Union environment ministry visited Visakhapatnam, tribal areas of the district observed bandh. Anti-mining protestors from different tribal groups and political parties, except the ruling Congress, blocked roads leading up to the Eastern Ghats. People wielding bows and arrows guarded some of the hilltops proposed for bauxite mining. The committee, which had come to study the socio-economic and environmental impact of the mining project, cancelled its visit to hills by road and returned after conducting an aerial survey. Anger is simmering in the tribal areas of the district—also known as Agency area—which fall under the Schedule Five category. Tribal groups and civil society organisations allege the Andhra Pradesh government is flouting all regulations and a Supreme Court judgement, meant to protect constitutional rights of tribals over their traditional land and resources, to appease two companies. Jindal South West Holdings Limited (JASWHL) and ANRAK, a joint venture of the government of Ras Al Khaimah from the United Arab Emirates and Andhra Pradesh-based Penna Cements, are setting up aluminium plants in the state for which bauxite is the raw material. “The government acquired environmental clearance for the mining project despite our strong opposition and without consent from gram sabhas,” says K Surendra, district president of Girijana Sangham, the tribal wing of CPI(M). 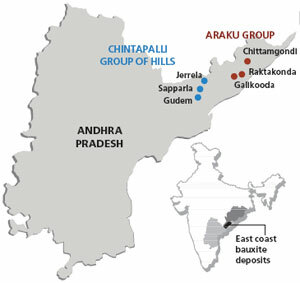 According to a study by the Centre for Economic and Social Studies (CESS) in Hyderabad, the government plans to mine 27 hills in Araku Valley, Ananthagiri, Chintapalli and G K Veedhi blocks. The project will affect at least 270 villages of Kondh, Bagata, Konda Reddi and Samanta among other tribes, who traditionally inhabit the Agency area. The Centre had stalled the project in 2010. It was the time around when people’s agitation had forced the Union Ministry of Environment and Forests (MoEF) to cancel clearance to Vedanta’s bauxite mining project in Niyamagiri hills in Odisha. But the recent visit by the MoEF committee shows fresh efforts are being made to revive the project. People feel betrayed as the committee’s visit came despite assurances by Union tribal welfare minister Kishore Chandra Deo, who hails from the Agency area, to take up the matter with MOEF and get the clearances cancelled. Andhra Pradesh holds 600 million tonnes of bauxite, which, according to the Geological Survey of India, is 21 per cent of the country’s total reserve. More than 90 per cent of this reserve is concentrated in six deposits in the Eastern Ghats of Visakhapatnam (see map, table). The deposits falls in the Agency area, which is part of reserve forests and has a rich biodiversity. Environmentalists have long been pressing MoEF to declare the region a biosphere reserve. But industries eyes the land. In fact, the state had initiated plans to tap the resource during the Telugu Desam Party regime in 2000. The then chief minister N Chandrababu Naidu had used every trick in the book to attempt amendments to laws governing land rights of tribal people and the Constitutional protection of Scheduled Areas, but had failed. The Congress regime under late Y S Rajasekhara Reddy, who came to power in 2004, managed to get around the problem. The first MoU was signed with JSWHL in 2005 and the next with Ras Al Khaimah in 2007. Jindal would set up a refinery to produce 1.4 million tonnes of alumina a year, mainly for exports, with an investment of Rs 900 million. ANRAK will produce one million tonnes of alumina and 250,000 tonnes of aluminium a year with US $2 billion investment. Since the Supreme Court’s Samata Judgement in 1997 prevents any private company from owning or leasing land for mines or industry in the Scheduled Areas of the state, the MoUs are made tactfully. The judgement had allowed public enterprises and cooperative societies solely run by the tribes to mine in accordance with the forest and environmental laws. So the Andhra Pradesh Mineral Development Corporation (APMDC), a public undertaking, will mine bauxite on behalf of the companies. “We will supply ore to Jindal from Araku blocks and to ANRAK from Jerrela block,” says K Rajasekhara Reddy, general manager of APMDC. The companies will bear the cost of mining. APMDC will receive 1.25 times of the royalty and 0.5 per cent of the annual turnover of the companies. Mining for ANRAK will start before June this year, he says. To avoid land transfer regulations, which prohibit transfer of tribal land to non-tribals, the companies are setting up plants outside the Scheduled Areas. “The government is considered the trustee of the natural resources. But APMDC is acting as a front company of the industries,” says G Srinivas of Samata, a non-profit whose petition is the precursor of the Samata Judgement. “The proposed mining plan negates the spirit of this judgment,” says E A S Sarma, former tribal commissioner. Besides, the government is yet to settle forests rights of the tribals. Around 160,000 ha of the Agency area belongs to the tribals as per the Forest Rights Act but the government has so far granted pattas (land titles) for around 16,000 ha. “In 2009, it made grand announcement about giving pattas for 40,500 ha, but nothing has been done so far. If mining is allowed before settling pattas, thousands of the tribals will be thrown out of their homes,” says Narasinga Rao, district secretary of CPI(M). APMDC insists that 26 per cent of the revenue earned from the project will be spent on development of the tribal communities as profit-sharing. It claims mining will generate employment for 20,000 people in the area, though an RTI query by Samata reveals that APMDC does not have details of the possible employment generation. However, it has selected 215 youths from the proposed mining areas and is providing them mining training and a monthly salary of Rs 7,500. Officials say the expenses will be borne by the companies. The committee insists the environment impact assessment (EIA) reports for the mining projects were prepared by prestigious institute, Indian Council of Forestry Research and Education. They elaborately deal with socio-economic issues of the tribals. But an analysis of these EIA reports by the Centre for Economic and Social Studies (CESS) shows the EIAs have ignored the social and livelihood issues of the tribals. A visit by Down To Earth to some of the tribal villages proposed for mining confirms this. Most villagers in the Agency area are small farmers with land holdings up to a hectare. They cultivate coarse rice, jowar, pulses and varieties of beans and coffee. Many eke out a living by collecting forest produces. India’s first tribal growers’ organic coffee brand was launched in the Araku Valley in 2007. The premium organic Araku Emerald brand of coffee has buyers from around the world. Thousands of tribals in the Agency area are engaged in coffee cultivation as farm hands or small farmers. Mining would affect over 1,400 ha of coffee plantations in the valley. “If the government can give us the same forest, same hill and same kind of coffee plantations as compensation, then maybe I’ll move out,” says Kora Bheemanna, a Nooka Doora tribe of Beesupuram village, on the slopes of Galikonda hills. He has half-a-hectare plantation, which fetches him around Rs 20,000 every season. “Once mining begins on their land, they will all turn labourers,” says B David, a Kondh youth working with Primitive Tribal Groups Welfare Association in Araku. 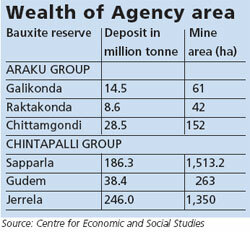 Going by APMDC, the Araku deposits will last only 15 years. Where will the cultivators-turned-labourers go after that, he asks. Further, with lush green forests, streams and waterfalls, Araku Valley is emerging as a tourist destination. “Araku is the state’s Kashmir,” says Poojari Gasi of the Tourism Tribal Contract Labourers’ Union of Borra Cave. The cave, considered the deepest in the country and lined with stalactites and stalagmites, is the main attraction. It is just three kilometres from the proposed mining site in the Ananthagiri hills. Since bauxite exists in thin but extensive layers on top of the topography, it has to be mined open cast. This would require clearing of a large forest cover and blasting off the hilltops up to a depth of 100 feet. Its impact on the sensitive ecosystem of the Eastern Ghats will be irreversible. At least six rivers flowing across the hills may dry up or reduce to a trickle. This will affect major reservoirs which are the only source of irrigation and drinking water for Visakhapatnam and Vizianagaram districts. Mountains of the Agency area and Odisha’s Niyamagiri are parts of the Eastern Ghats. One wonders why MoEF cancelled mining Niyamagiri and is yet allowing mining in the Agency area. Ministry of environment and forestry must be the strongest backbone for indian economy but it has always been highlighted to overule the environmental issues.Inspite of helping and supporting the farmers and gram sabha,the ministry is spoiling the environment.The MOEF management is so pathetic that it takes years to submit reports on the flora and fauna reserve. Not only the project is completely illegal because it violates Samata's judgement and would require the consent of the local communities, but economically it is insane for India to hand its minerals to private companies, mainly for export, when all the other world economic power are on the contrary trying to secure their reserves of these finite resources... The so-called expert committee held a public hearing in Vizag but the only objective was to convince the people they had to accept the project. What is the point of a consultation if the decision is already made? 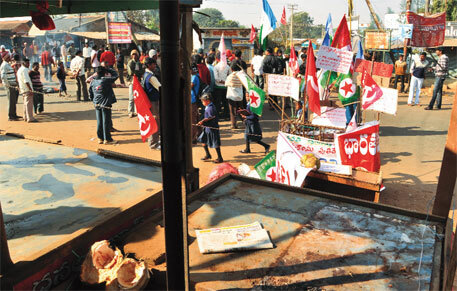 How can they ignore the bandh and the general opposition all over Araku? I read your article with great interest. In addition to the very important issues brought up by you I would like to mention the TRANSPORTATION NIGHTMARE that will come with the mining of the Jerala hills. The ANRAK website has an innocuous sentence at the end of it saying: "A newly laid road is envisaged which will be traveling for 15 km in forest land starting from Jerrela village to the state highway near Pederu. From there it is connected to NH5 for onward movement to the proposed plant location." This is probably written by someone who has little idea of the roads of the area. I could not figure out how they will reach Makavaripalem from Chintapalle via Paderu and NH5! It is obvious that they intend to come down via Lambasinghi and take a left before Narasipatnam. I understand that they have already started making a road diagonally from a few kms before Narsipatnam to Makavaripalem. Which ever route they take the statistics are mind boggling. They have indicated that they wish to move 4.5 Million Tons of Bauxite per annum. This figure throws up some interesting logistical statistics: Considering the narrow ghat roads - if they use a 16T tipper truck the stats are as follows: Quantity of Bauxite to be moved per year is 4,500,000 tons (4.5m Tons) Truck loads per annum with 16T Tipper: 281,250 That works out to 770 Truck loads per day travelling in one direction - I shudder to calculate the figures in both directions Divide that by 8 hours a day and you get 96 Trucks per hour And that translates to 1.6 Trucks every 60 seconds! If they use the huge 25 Ton multi-axle trucks instead of the smaller 16 Ton ones it will still be 1 Truck every sixty seconds! So if we were standing on one side of the road and wished to cross we would have only seconds between trucks! (If they travel only in one direction) There will be hundreds of human and cattle road deaths a year! If APMDC was shifting such quantities of material, no one else will be able to use the road. What will happen to the hundreds of village santhas all along the route? How will public transport such as buses, auto rickshaws and farm produce trucks ply? How will animals - cows, buffaloes and sheep - be driven to the santhas? Then there is the issue of tree felling. Road widening between Narsipatnam and Downuru - the foothills of the Chintapalli ghats - has already caused hundreds of large old trees to be felled. If the ghat sections are widened there could be more than 20,000 trees that will be lost. A crime against humanity during these days of global warming. On one hand we declare targets to increase tree cover and on the other hand we chop off thousands of huge old trees. Then consider vehicular dust pollution. Each truck during its journey from mine head to the refinery and back will throw up 200 to 300 kgs of mud and dust into the air. The amount of dust thrown into the air in a year will be a whopping 80,000,000 tons (80 million tons). The road and the roadside trees will be red! It will become unbearable for anyone to live and work along the roadside. Plus add to that vehicular exhaust. I wonder if this has been studied by our friends in the PCB. Lets talk about water. ANRAK want to tap 5 million gallons per day from the Yeleru Left Main Canal for their refining unit. I understand that they have sanction for 10 m gallons. But let us take the lower figure. Now, 5m gallons per day is equal to 5,000,000 X 4.5 = 22,500,000 liters per day! Estimating that each person needs around 100 liters of water per day for cooking, drinking, bathing and washing - this water can be used by 225,000 persons each day! Equivalent to the population of a standard town. I mention this to illustrate the enormity of consumption. In reality the water from the Yeleru canal is meant predominantly for agriculture and partly for domestic use. There are other huge impacts - and we all know it already - most importantly on the ecology of the hills and on the livelihoods of the Adivasis. This giant in our neighborhood will make life unlivable for thousands of people and will deprive them of resources as never before. An entire generation will be affected and after the hills have been raped it will take a thousand years to recover - if it recovers at all. If its in a scheduled area, then Governor has enough powers to cancel transfer of land. And for that, he is not even bound by the aid and advice of the council of ministers. Schedule 5 says "(2) The Governor * * * may make regulations for the peace and good government of any area in a State which is for the time being a Scheduled Area. (a) prohibit or restrict the transfer of land by or among members of the Scheduled Tribes in such area"
If somehow possible and also if its seems correct, then this should be communicated to the protestors. Maybe the Governor can hear better than the minister.